You may not know that you have pests and termites in your home until its too late, and the damage has already been done. It is crucial to regularly inspect and maintain your attic and crawl space, as taking action on time will ensure that your residence as well as work place remains clean, safe and hygienic. 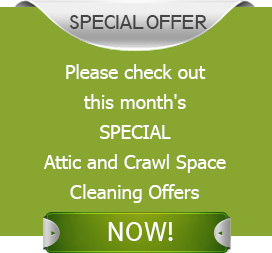 Call Quartz Solutions today for a free inspection of your attic and crawl space. We developed and perfected advanced work methods and products that are highly effective when dealing with pest control problems. We understand that each customer and situation may be unique and therefore strive to provide tailor made solutions. The numbers speak for themselves. That’s why we have the highest customer satisfaction rates, and we are considered the “go-to” company for pest control solutions. If you start to notice bugs or termites and you don’t address the problem immediately, it might become a menace. Your household may even have to be evacuated in order to turn the damage around, not to mention the thousands of dollars it might have to shell in order be to fix the problem. Leaking ducts tend to inflate energy bills. They also have the potency to spread dangerous microorganisms in the house/office. 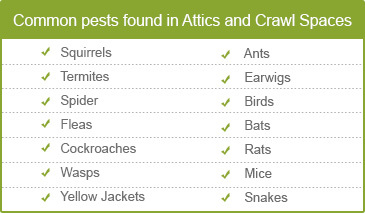 Insects like wasps, roaches and termites can pose a serious health hazard. Animals like rats may look small and harmless, but they can wreck havoc in the property by damaging foundations, insulation wires and more. Mold and mildew thrive on excessive moisture. It’s presence leads to wood and structural damage, therefore, increasing the cost of overall maintenance. A careful and thorough inspection of the attic and crawl space is the first step towards having a clean and well-maintained property. By upgrading the hidden areas of your home, you increase the overall value of your investment and ensure it will keep its value for the long run. Testing the area for radon gas, a known carcinogen, is crucial for your family’s safety. The first inspection can help reveal the actual condition of the property and help prevent further damage. The inspection is carried out by our trained staff, will scheduled for a time that is convenient for you, and it’s completely free of charge. Once we complete our report, we’ll be able to devise a plan to get your property back in shape in just couple of days. We understand how hard you work for your money. Therefore, our solutions are reasonably priced and extremely competitive. Bergen County New Jersey is our home! We care about it as much as we care about this wonderful community. At Quartz Solutions, we take it unto ourselves to keep attics and crawl spaces at tip-top shape. This is our own little way of helping ensure that Cliffside Park, Bergen County, NJ residents get the service they need in order to take care of their properties. Here at Quartz Solutions, we want to ensure that homes and businesses are safe and secure. Therefore, we invite you to call and book your free inspection today 201-205-2042 to set up a free consultation and inspection.